SoftPlanet makes it possible for everyone to get free VIRUSfighter download directly from our servers. There is no registration needed for downloading. Computer programming is a great thing because it makes all these helpful programs that you use on a daily basis possible but it can also be used for bad purposes – such as for creating malicious software. Unfortunately with the growing number of computers malicious software also tends to increase so you always need solutions to the threats that lurk on the Internet or on other computers. 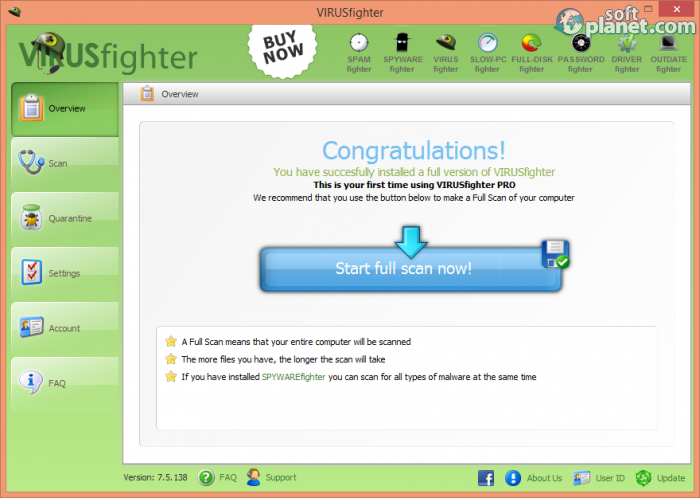 VIRUSfighter 7.5.146 is one such solution – this is an antivirus software program that can help you find and eliminate malicious software from your computer. VIRUSfighter 7.5.146 might seem to be just another antivirus program but if you think like that you will be wrong. In fact this application has a large number of strong points with some of them being a small-sized setup file, making it easy on you to download and install it, an easy and fast installation process, a nice and original interface, and frequent automatic updates. The app also has a number of different functional modes to choose from as well as a full set of options and features so you can rest assured you are in good hands when you use VIRUSfighter 7.5.146. The interface of VIRUSfighter 7.5.146 is rather interesting and original. The app will greet you with green colors and a military helmet to show you that it does really fight the bad software that may infect your computer. This is an original idea, which we liked a lot. Then if we look beyond the green color we will see that VIRUSfighter 7.5.146 has an interface that resembles the interfaces of most other antivirus programs. Everything has been made nice, good-looking and easy to use. Most of the program features can be found to the left where you will see icons for the program settings, a FAQ area, an icon for scanning, an icon for overview information and more. The upper right corner of the interface is taken by a few small icons of other tools by the same developer and when you click on them you will be able to automatically download and install these applications. At the bottom you have buttons for the program version, support, updates and more. The rest of the program window is taken by an area, where the main action takes place – this is where you can choose whether to perform a quick scan, a full scan and more. 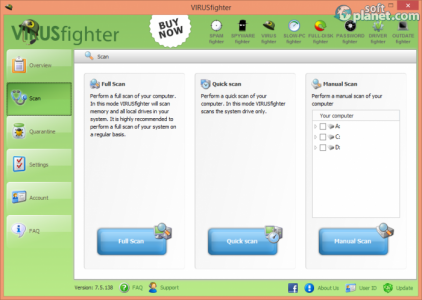 VIRUSfighter 7.5.146 can be used in the same way as many other antivirus programs. When you run the program for the first time it will perform an automatic update just for you. Then you can choose whether to change the program settings, to scan your computer, quarantine suspicious files, check your user account and more. Perhaps this is the place to say that this antivirus utility does not come for free and after 30 days you will have to purchase the program in order to keep on using it. VIRUSfighter 7.5.146 is something new and fresh in the antivirus world. Although the program resembles many others of the same kind you will find nice features that distinguish it from the rest with one such feature being the useful and original user interface. The rest when it comes to this tool is the same as in other virus-fighting programs but this makes VIRUSfighter 7.5.146 easy to use and you can start away with it. Just don't forget to purchase this tool after 30 days of usage. Our security scan shows that VIRUSfighter is clean from viruses. The current version of VIRUSfighter has been scanned by our system, which contains 46 different anti-virus algorithms. That ensures that VIRUSfighter 7.5.146 is 100% safe for your computer.